From Norton, comes this report of the top 100 searches for 2009. Youtube, Google and Facebook come in for the top three, nothing surprising there perhaps. But the 4th and 5th most popular search term may be a bit more worrying. 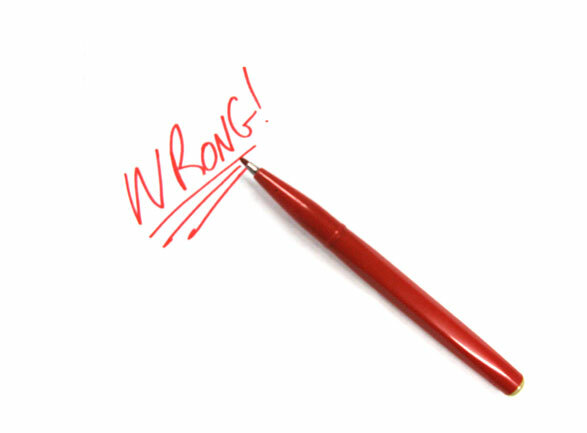 Throw out the red pens – according to Queensland Health – they are too aggressive. I heard this on the news tonight and thought how ridiculous. TEACHERS are being warned to use bean bags to reduce student stress, organise “mind dumps” to clear kids’ thoughts and even stop using “aggressive” red pens. In a controversial suite of tips that has divided psychologists, a Queensland Health kit tells teachers to use blue or black pens to mark assignments because red is considered too confrontational. The effort to handle students with care – backed by Health Minister Stephen Robertson, pictured – also includes teachers being told to apologise to them when necessary and organise “check-ins” at the start of each day to assess how they are feeling. The Queensland Council of Parents and Citizens Associations last night demanded the kit be scrapped. “It is definitely over the top and quite unbelievable,” council president Margaret Black said. The Good Mental Health Rocks kit – of which 1000 have been distributed – was revealed in State Parliament yesterday by the Opposition, which has labelled the red pen advice “kooky, loony, loopy, Left policy”. The kits were distributed to 29 schools which participated in the Queensland Rock Eisteddfod this year. The Bligh Government yesterday defended the kits, which cost almost $3000, and labelled the attack a “cheap political stunt” which failed to understand serious mental health issues. 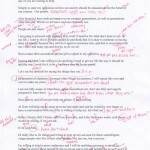 Mr Robertson said teachers did not have to use the advice devised by specialists as it contained only hints and tips. “This is not something you ridicule,” he said. Opposition health spokesman Mark McArdle said the pen advice showed priorities were wrong when literacy and numeracy levels were so low. “This is a kooky, loony, loopy, Left policy from a Labor Government that is out of touch,” he said. The kit said the so-called “mind dumps” allowed students to write down everything in their mind and then throw the piece of paper in the bin. Another tip was a “steam time”, allowing for one-on-one chats with teachers each week. Psychologists are split on the red pen advice but Toowoomba child psychologist Paul Bramston said a softer colour could help some children with problems. 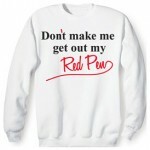 “The red pen brings up association of aggression more than blue or black as red is linked more with dramatic things like stop signs,” Dr Bramston said. Queensland Teachers Union president Steve Ryan hung up on The Courier-Mail after claiming the kit did not exist and the Government would never give that advice to teachers. “Mental health is a serious issue,” Mr Ryan said. 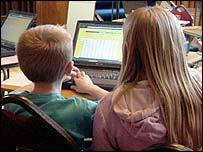 Mental illness group Mind Frame said about 14 per cent of children between four and 17 suffered from mental problems. Hopefully, things never get this bad. 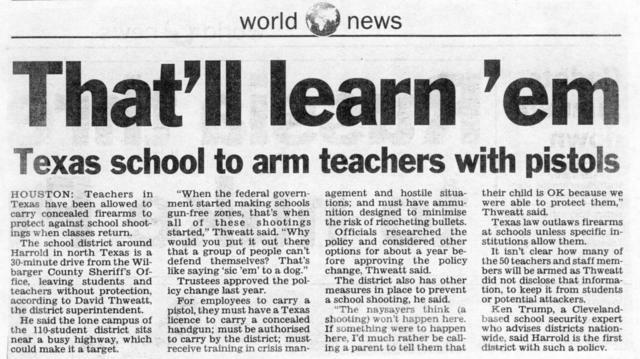 The boss showed me this recent newspaper clipping – Teachers in Texas have been allowed to carry concealed firearms to protect against school shootings when classes return. 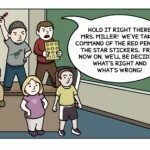 Six-figure pay for ACT Teachers??? This newspaper report from the Canberra Times talks about how the ACT Education Minister believes that their best teachers should be earning $100,000. What is interesting though is actually hearing it come from a minister within the Government. Maybe we’ll need to keep an eye on the positions vacant within ACT over the next couple of years??? 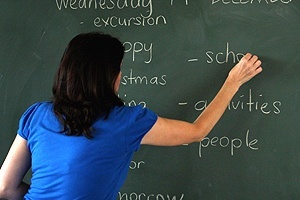 The ACT’s best teachers could earn six-figure salaries within three years under an ambitious plan to halt a skills shortage and increase the status of the profession. From The Australian comes this report. It would be very handy if we could have access to all the other Google Apps as well – Chat, Docs and Calendar. GOOGLE has edged out some of the biggest brands in the enterprise IT services market to pick up another major contract win in Australia’s education sector. Google partner SMS Management and Technology has emerged as the leading bidder to supply the NSW Department of Education with 1.5 million student email services using a customised version of the search giant’s Gmail service, Acting NSW Minister for Education and Training John Hatzistergos said. “This commitment is a further demonstration of the NSW Labor Government’s commitment to equip teachers and students with the best possible means to compete successfully in the constantly evolving world of information technology,” he said. NSW education department chief information officer Stephen Wilson said the department was yet to finalise its contract with SMS but confirmed that it had lodged the winning bid. SMS will be the prime contractor alongside Google and Telstra to fulfil the contract, valued at $9.5 million over three years. It’s expected to be completed by the end of 2008. The department rejected bids from Hewlett-Packard, Telstra subsidiary Kaz, and incumbent provider Unisys, to award the contract to SMS. It’s understood that the contract will be one the largest private deployments of Gmail in the world. The win is Google’s second major victory in the academic sector after Macquarie University signed up for Gmail in September last year. It could have massive implications for the Australian software market, as it places Gmail’s online word processing software, Google Docs, in a strong position to challenge Microsoft’s Office software suite in the education sector. Mr Wilson said the agency had no plans to switch on Google’s online word processing software at this stage. “We haven’t made any decision there. This contract was just email,” Mr Wilson said. SMS chief executive Tom Stianos said the trend towards providing software as a service was “unstoppable”. However, the Gmail deployment at Macquarie University hasn’t been without controversy. Gmail is hosted offshore and the university chose not to extend the service to staff due to concerns that it would generate excessive bandwidth bills retrieving messages. The education department’s Gmail roll-out will increase current email storage allocated to students by a multiple of 170 times from 35MB to 6GB. The department is also deploying extra security filtering, which will be carried out locally. “You have to remember we’re the largest consumer of internet traffic in NSW by a long way. “We’ve modelled it so we can grow substantially on the current email traffic and still have a cost-effective solution,” Mr Wilson said. Students will not be given access to Gmail’s chat service and NSW teachers will be moved to the agency’s corporate email system rather than being allocated Gmail accounts. Mr Wilson also said Google may host some of the email storage locally, further easing pressure on international bandwidth requirements to operate the service. Mr Stianos said Google was examining local hosting options. “I understand that they are talking to other state education departments in Australia and as part of that they’re looking at the potential of establishing a centre in Australia to host Gmail,” Mr Stianos said. It looks impressive, don’t it?? I think I would have enjoyed going to the opening of the new Apple Store in Sydney. 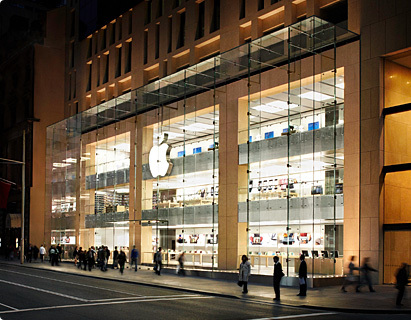 Located on George Street, apparently it has the biggest sheets of laminated glass in the world, biggest Apple Logo in the world, biggest Genius Bar in the world. It’s not the largest store in the world however, it does come close – it’s the second largest!! The glass is 15 metres high!! Pretty Amazing. Martin Levins has some more pictures which are worth a look. 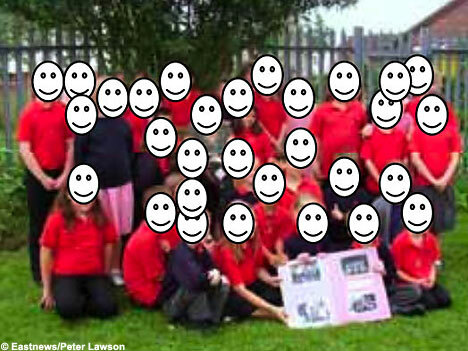 According to the Daily Mail, Cann Hall Primary School in Clacton, Essex is covering up the faces of pupils in photos on its website with a smiley. Seems to me, that it sort of defeats the purpose of putting photos on the website? Is it a bit too overprotective?? A STRIPPER performed for a classroom full of teenagers, spanked a birthday boy and asked him to rub cream over her after a booking error by the teen’s mum. It is believed the mother thought she had booked a gorillagram to rush into her 16-year-old son’s classroom for a birthday surprise – but a stripper turned up instead. The Daily Mail said the teenager’s mother had told the teacher beforehand that a “birthday surprise” would walk in during the class and requested that it be filmed. Instead of a gorilla, an adult performer showed up at Arnold High School in Nottingham dressed as a policewoman and spanked the boy 16 times in front of his classmates, the newspaper said. She stripped to her underwear while dancing to a Britney Spears song and asked the teenager to rub cream all over her body before the “stunned” teacher called an end to the act. One student told the newspaper that the performance occurred in the middle of a drama class. 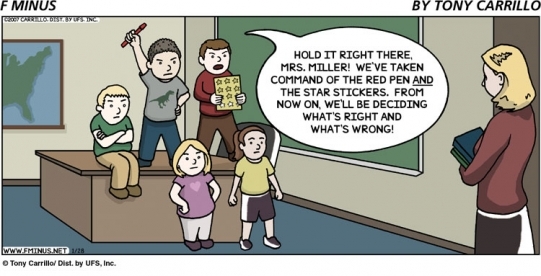 “The teacher suddenly announced: “Something is about to happen”,” the student said. The performer put on some music and had the teenager put a collar on her. 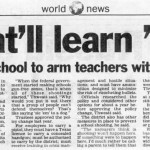 “No one could believe it,” the student said. The newspaper quoted the student as saying that it was when the stripper pulled some cream out of her bag that the teacher took action. The student said the birthday boy ran out of the classroom while the stripper packed her bag. 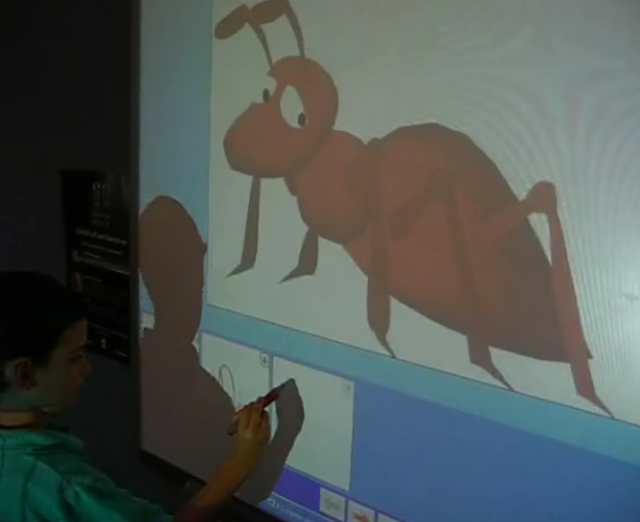 The winners of Smarttech’s World Teachers’ Day Video Contest for 2007 have been announced – with the global winner being Miss Lisa McCallum, a Kindergarten teacher at St. Therese Primary School in Sydney, Australia. View their winning video now by clicking the picture below. A Hell of a name..
Here’s a news article I came across the other day, What’s in a name? For would-be pupil Max Hell, it’s been, well, hell, over at The Age newspaper. Apparently, it has been alleged that this catholic school refused enrolment based on the child’s surname – Hell. A CATHOLIC primary school in Melbourne’s west has refused to enrol a prep student because the family’s surname is Hell, the boy’s father claims. Alex Hell said his eldest son, Max, 5, was refused entry to St Peter Apostle Primary School in Hoppers Crossing last month after he reneged on a deal with the principal to change Max’s surname to Wembridge, his mother’s maiden name. Mr Hell, 45, a self-employed father of three, said he suggested the name change, knowing first-hand the teasing the surname attracted in the Catholic sector. He said his own schooling at St Margaret Mary’s School in Spotswood saw him victimised because of his surname, which in Austria means light or bright. Mr Hell is of Austrian heritage. The family decided to change Max’s surname when moving him from a nearby state school to St Peter Apostle Primary. “Most kids in primary school probably wouldn’t know what hell meant but in the Catholic schools, heaven and hell is an issue,” Mr Hell said. After consulting the parish priest, Father Greg Bourke, the school’s principal, Michael McGrath, agreed and welcomed the name change for the enrolment. Mr Hell said he was now reluctant to consider a Catholic education for his children. “I’ve had enough. I was ridiculed as a child â€¦ I want him to be accepted as Max Hell, but obviously he’s not,” he said. The director of Catholic education, Stephen Elder, said yesterday the primary school had accepted Max Hell’s enrolment.